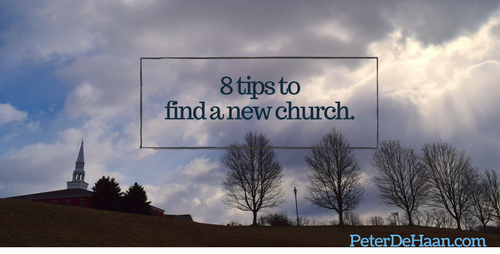 Last week we talked about when not to change churches, instead of looking to find a new church. Too often people treat their church as a commodity and behave as a consumer, switching their loyalty over trivial things. Most of the time, however, the best action is to view your church as a marriage and try to make things work. Seldom should you divorce your church and seek a new one. Even so, sometimes we need to find a new church home. Maybe we just moved, or our church closed. Perhaps we do it for the sake of our kids, seeking a church community to encourage them in their faith and support our efforts at home. And sometimes newlyweds decide it’s best to not subject one of them to the other’s home church but to find a new one where they can start their life together with a new church family. If you find yourself in a situation to change churches, here are some tips to do it wisely and enjoy the best outcome. In doing research for my book 52 Churches and subsequent works, my wife and I visited over a hundred churches. In doing so we learn how to visit churches, both the right things to do and the wrong things. Look online to learn about the church before you visit. When considering church websites and social media pages, be aware that some are more like dating profiles, showing you what they want you to see, obscuring reality, and ignoring faults. Others are more realistic. Look for what to expect and how to get the most from your experience there. Note their location and service times. Sometimes it’s worth double-checking this information, as more than once a church’s website gave us wrong information. Then schedule a time for your visit. But what if the church isn’t online? If a church today doesn’t have an online presence, it’s unlikely they’ll be around tomorrow. Save yourself the grief, and skip them. In visiting fifty-two churches, my wife and I prayed as we drove to each one. And once we finished visiting churches, we continued this practice each Sunday. These prayers often vary, sometimes focused on our own struggles and other times on our desire to learn what God would have us to learn. Often, we pray we’ll have a positive impact on others, and sometimes we ask for an openness to receive what others would give to us. More than once I’ve had to pray for my attitude. But the key is to pray, and let the Holy Spirit guide those prayers. Prayer makes all the difference. If you visit a church looking for what’s negative, you’ll find it. If you seek things to criticize, you’ll uncover plenty. The key is to arrive with God-honoring expectation. Every church has something positive to offer, just as every church has its struggles. No church, just as no person, is perfect. Look for the good and celebrate it. It’s hard to connect with people at church during the service. And even those churches that allow for connection time as part of their service, often fail to do it well. Instead, plan to arrive early so you can interact with people before the service begins. And don’t schedule anything afterward, so you can stay as long as you want without the pressure of time. Sometimes my wife and I would hang out for five or ten minutes after the service and leave because we weren’t able to talk with anyone. But other times we’d be there for an hour or two after the final “Amen,” enjoying rich Christian community. Often this involves food, which is in added benefit. Finding Christian community is the main reason we should not give up meeting together (Hebrews 10:25), which most people think means going to church. If you can connect with the church community, it makes all the difference. Visiting a church is like visiting someone’s home. You want to respect their practices. This means if you’re a raise-your-hands or jump-up-and-down type of person, but the church isn’t, follow their practice. Don’t stand out in a bad way. This distracts from your experience, as well as their worship. However, if their style is more exuberant than you’re comfortable with; feel free to be yourself. Whether you’re visiting once, making a follow-up appearance, or attending as a regular, look for ways to give back to the church. This might mean offering encouragement, looking to pray for people (either out loud or silently), or being a positive influence anyway you can. Though my wife and I didn’t contribute monetarily to the churches we visited, you may feel differently. In which case you can also give financially. Visiting a church once makes an initial first impression. This may be accurate, but it might not. One church encouraged us to come back twelve times before deciding. Of course, they knew anyone who came back that often, would form a habit and stick around after the three months was over. I’m not sure if you need to visit twelve times, but certainly more than once is needed. When my wife and I moved, we faced finding a new church home. For those churches that we revisited, our first experience often differed from our second. Sometimes it was better, and other times it was lacking. Regardless, one visit isn’t enough. As we talked about in “3 Keys to Successful Church Involvement,” it’s important to push aside a passive perspective when visiting a church. This means avoiding notions of consuming, attending, and criticizing—which are all too common at most churches. If you find yourself needing to switch churches, follow these tips to get the most from the experience and home in on your new church community.